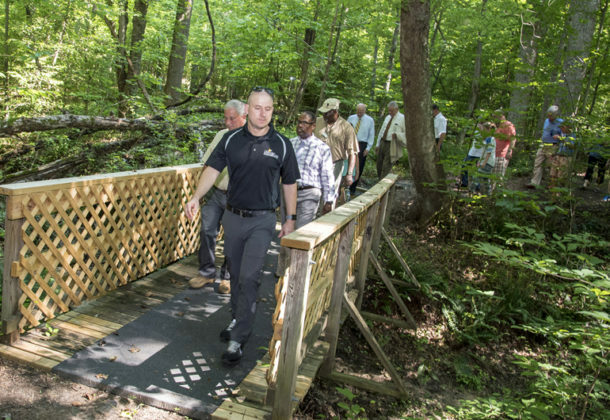 College of Southern Maryland has opened a renovated Fitness and Nature Trail on its Leonardtown Campus. Open to the community, the trail is intended for recreational and educational use. The trail is less than half a mile long and was first created before the college bought the campus property in 1997. The renovation of the trail, which has taken about a year, included widening and clearing the path, rebuilding bridges over a creek, signage, landscaping, and identification of trees. The college’s Wellness staff is also excited about the opportunity to expand fitness options at the college, Dr. Harris said. The trail is on the college’s Leonardtown Campus, behind the Wellness and Aquatics Center. New signs direct visitors to the trailhead. The trail meanders through a forested area on the campus, crossing a creek that was created by runoff from the Town Run Stream, up and down some hilly areas. It includes views of massive, old trees and a variety of native flora. Several partnerships in the community have helped the renovation project, led by Dominion Energy, which provided a $10,000 grant for the project. Other major partners include program director for the Natural Resources Management Program at the Dr. Forrest Career and Technical Center John Spinicchia, Patuxent Tidewater Land Trust Director Frank Allen, Director of Environmental Planning and Conservation at Naval Air Station Patuxent River Kyle Rambo, Cove Point Natural Heritage Trust Board of Trustees Business Manager Bob Boxwell, Maryland Department of Natural Resources Dave Gailey, and CSM Biology Professor Tracey Stuller. A ceremony July 2, 2018, officially opened the CSM Nature and Fitness Trail with CSM Board of Trustee Chair Ted Harwood, Vice Chair Brad Bates, Leonardtown Mayor Dan Burris, and CSM staff and faculty joining the ribbon cutting and walking the trail. The trail will be open from dawn to dusk. No golf carts, all-terrain vehicles, or bicycles are allowed on the trail. Pets must be on leashes. For information on other ways the college is focusing on environmental sustainability, visit CSM’s website. For photos from the trail opening, visit the college’s photo sharing site. For a list of trees and other natural foliage currently identified on the trail, visit CSM’s news site.